With over 30 years in the business of defibrillation, ZOLL® has the experience and products to assist you throughout the automated external defibrillator (AED) implementation process. Not pushing hard enough? The AED Plus® will tell you when to push harder. According to OSHA, automated external defibrillators (AEDs) are an important lifesaving technology and may have a role to play in treating workplace cardiac arrest. Information is provided below regarding occupational risk factors and the use of AEDs in the workplace. AED Programs Give Lay Rescuers Confidence - Hank Constantine, ZOLL Director of Marketing for AEDs, focuses on the lay rescuer in this ISHN article, and how to give him or her the confidence and courage to act swiftly and decisively. That response depends on preparation and training, which in turn depends on having an AED program in place. Occupational Heart Disease. National Institute for Occupational Safety and Health (NIOSH). Addresses many of the hazards associated with occupational risks of coronary heart disease. Saving a Life Is as Easy as A-E-D. 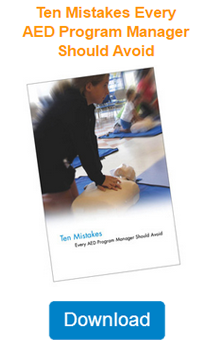 The American Red Cross offers additional information and training in CPR and the use of AEDs.